Photo courtesy of Talman Madsen. For international visitors, Christchurch is often their gateway to New Zealand’s South Island, and on our first trip to Te Wai Ponamu, we were no exception. We arrived with our minds set on adventure, and the area provided plenty, with skiing, hiking and exploring opportunities around every corner. That and awe-inspiring landscape: oceans, hills and mountains where ever you care to look. Christchurch itself is a wonderful city with some of New Zealand’s oldest architecture, but it was tragically devastated by a large earthquake in 2011. It is testimony to the resilience of its people that the city continues to rebuil itself, piece by piece, after an event that had a huge impact. Our first trip sealed our love for this country. Its mountains and rivers, its rolling hills and wild oceans. And we fell in love with its people. Some of the friendliest in the world, New Zealanders have offered us their hearts, their homes and their stories. These trips have weaved a rich story of friendships and adventure across a magnificent landscape. While the people stole our minds, the land stole our hearts. A country of very few people, it doesn’t take long to leave urban centres behind in New Zealand. Driving over the winding roads between towering snowy peaks, we headed inland and discovered the Church of the Good Shepard. A tiny structure, surrounded by the majestic grandeur of the mountains, we fell in love with that little stone church in the middle of nowhere. It stands by Lake Tekapo, sitting close to Aoraki, the tallest mountain in New Zealand. The saying, build it and they will come, must have been held dear by those early settlers, because it would have taken a strong and passionate believer to make the trail to its doors in the early days of New Zealand’s colonial history. 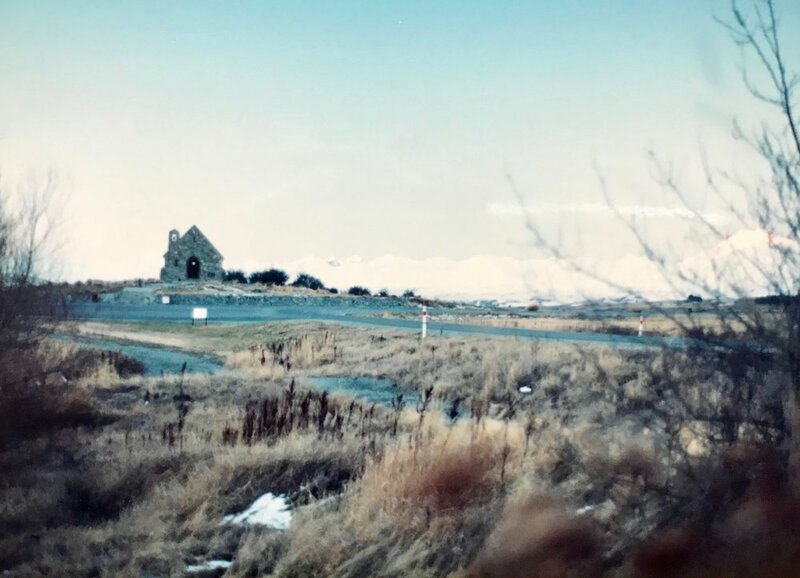 Photo of The Church of the Good Shepherd we took more than 20 years ago. It shouldn’t be much of a surprise that this glorious slice of the world became the setting for a very special event in my life. After eight years with my best friend, we decided to get married. Finding a magical place for our wedding venue was very important to us. We believe that big, meaningful moments in life should be sealed in special places. This tiny church in the middle of nowhere is one of those special places. For me, nature always becomes the canvas for these amazing moments and that little church by Lake Tekapo in the South Island was perfect. The thought of having the snow-laden Aoraki as witness to our ceremony was pretty special and still is to this day. Photo taken by Sonya Crook. The mountains of New Zealand’s south have always resonated with me. Being on them, beside them, below them, I feel a sense of peace, tranquillity and strength. Starting when I was at university, I began a love affair with this part of the world, travelling to Christchurch or Queenstown to ski and walk the wild rocky paths. Treble Cone, Cardrona or the club fields like Craigieburn or Porter Heights became the backdrop of my young-adult years. We pushed our limits on those trips and along with trekking through the Routeburn and Able Tasman tracks. Exploring the South Island with our family. After days of skiing, we were taking a break from skiing and hiking through the Rees Valley . Rees River flowing by in the background. Photo taken by Lyzadie. It is no wonder then that our love of the South Island informed our first collection. The FLOW Collection was inspired by the patterns of the South Island’s glacial braided rivers. These distinctive patterns that meander from the mountains to the sea are beautiful to stand next to. But from a above they are breath taking. These rivers speak of the flow of life from mountain to sea set within the broader context of repeating weather cycles. From the ground you experience the braided rivers as arms and branches, everywhere flowing differently from one place to the next. You stand at the bottom of the mountains in those valleys, feeling small yet part of it all. But from the air you can see the pattern as a whole, the depths and pathways shown as different hues of turquoise blue. Breath taking. The pattern of the braided river is a universal one. It represents so many things in the natural world. A body of veins, the nervous system in our bodies, the branches of a tree, a running river: like other patterns in nature, they tell a unique story of a particular area and its culture and heritage. There is so much meaning behind these organic patterns and in their abstract form we can read our own story. A story that is inherently personal. Nature uses patterns to communicate and we do the same thing and have done so for thousands of years. It’s this dedication to nature, to what is all around us, that we try and imbue in our designs. It is nature that inspires us, nature that leads us on. We hope you find the result as special as we felt privileged to create it.